This jewelry collection is made with natural found Sea Glass and washed up Hawaiian Seashells, other than the Sunrise Shells. 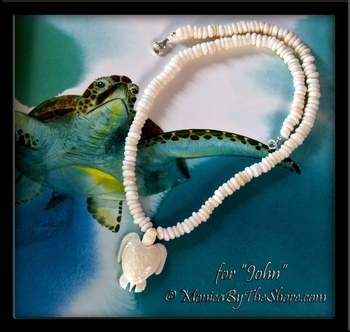 The Seashells and Sea Glass pieces are collected one by one on the North Shore beaches of Oahu, Hawaii. 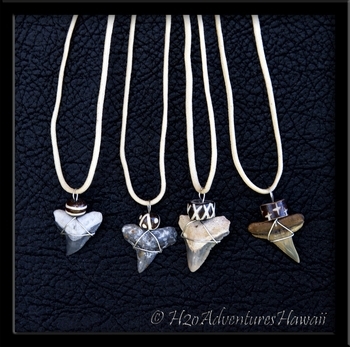 As you have come to expect from my Sunrise Shell jewelry, the other types of Hawaiian Seashells included in this collection are of the highest quality to be found in the islands. Each shell will be of perfect, pristine condition and this collection will include Cowrie, Opihi, Miter, Drupe, Triton, Puka and Cone, among others, and will be of a more modest price than the rarer Sunrise Shell. 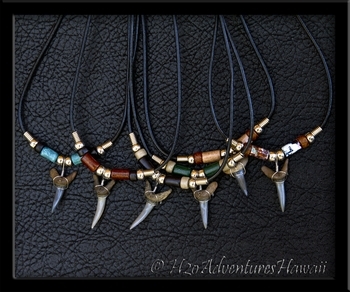 Fossil Sharks Teeth jewelry also! The designs will be natural and organic in nature in hopes to showcase the Seashell in all its beauty without additional embellishment. 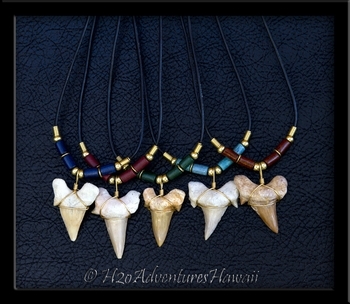 I hope you enjoy these new creations, hand made with Aloha on the North Shore, Haleiwa, Hawaii. If you see an item that has been marked SOLD but you like it, please email me at MonicaByTheShore@live.com and we can talk about reproducing the design for you! Hawaiian Style Glamour! Beautiful snow white spiral Seashells with black and white Pearls, on sterling silver! The perfect accessory for any black and white outfit, these beautiful earrings dangle a dramatic 3 inches in length! Put your high heels and pretty dress on and get ready for compliments on your Island Style seashell bling! 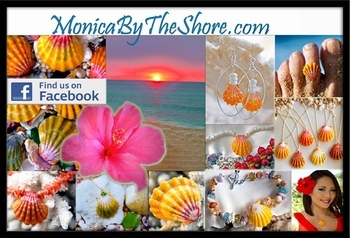 A MonicaByTheShore original Hawaiian Sunrise Shell and Seashell jewelry designs, hand crafted with Aloha on the North Shore of Oahu in Haleiwa, and Honolulu, Hawaii. Chunky Hawaiian Puka Shells on a single wrap around cuff bracelet! Colorful Puka Shells show off purples, browns, white, tans and golds, with a variety of textures and patterns. This bracelet has some weight to it! These beautiful seashells are brought to you with Love from Ke Iki Beach shorebreak, on the famous North Shore of Oahu, Hawaii! 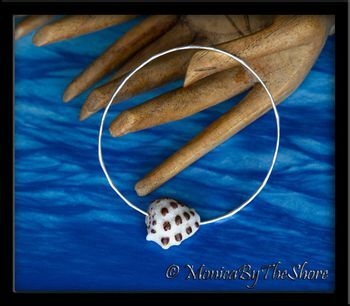 A gorgeous spotted North Shore Hebrew Cone Puka Shell from Ke Iki Beach dangles from a shiny Scallop textured 14K gold filled bangle bracelet! This beautiful Puka Shell slides along the wavy texture of the bangle bracelet that catches the sunlight and sparkles with Aloha! Wear one or a stack a few and have Fun and Enjoy! This bracelet sized at 8 1/4 inches circumference and is 14 gauge gold wire. 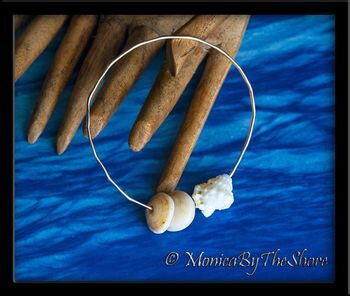 A chunky North Shore Puka Shell from Ke Iki Beach dangles from a wave pattern bangle bracelet! 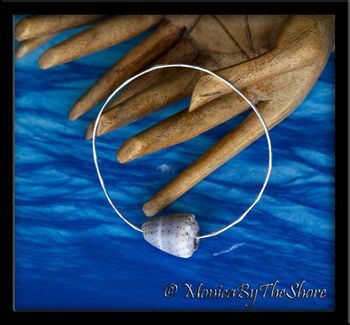 This Puka Shell shows pretty purple and brown colors as it surfs along the wavy open ended bangle bracelet. Waves and Puka Shells, nothing says "North Shore" more than this! A beautifully marbled, chunky North Shore Puka Shell from Ke Iki Beach dangles from a shiny Scallop textured 14K gold filled bangle bracelet! This unique Puka Shell slides along the wavy texture of the bangle bracelet that catches the sunlight and sparkles with Aloha! Wear one or a stack a few and have Fun and Enjoy! This bracelet sized at 9 inches circumference and is 14 gauge gold wire. Two precious North Shore golden Puka Shells and a tiny gold and white Conch Shell, all from Ke Iki Beach, dangle from a shiny Scallop textured 14K gold filled bangle bracelet! These beautiful shells slide along the wavy texture of the bangle bracelet that catches the sunlight and sparkles with Aloha! Wear one or a stack a few and have Fun and Enjoy! This bracelet sized small at 8 inches circumference and is 16 gauge gold wire. 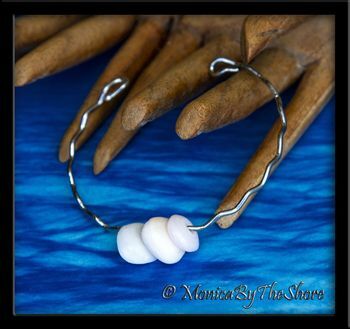 A trio of three North Shore Puka Shells from Ke Iki Beach dangle from a wave pattern bangle bracelet! These Puka Shells show pretty lavender and bright white colors as they surf along the wavy open ended bangle bracelet. Waves and Puka Shells, nothing says "North Shore" more than this! 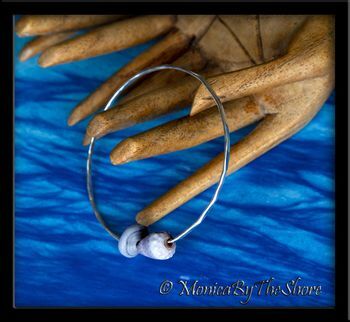 A solid dark gray Puka Shell joins an Abbreviated "Money" Cone Shell, both from Ke Iki Beach on the North Shore, dangle from a shiny Scallop textured sterling silver bangle bracelet! These shells slide along the wavy texture of the bangle bracelet that catches the sunlight and sparkles with Aloha! Wear one or a stack a few and have Fun and Enjoy! This bracelet sized at 8 1/2 inches circumference and is 14 gauge sterling silver wire. 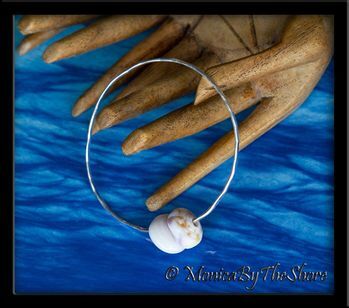 A chunky North Shore Spotted Puka Shell from Ke Iki Beach dangles from a wave pattern bangle bracelet! This Puka Shell shows beautiful golden brown patterns and color as it surfs along the wavy open ended bangle bracelet. Waves and Puka Shells, nothing says "North Shore" more than this! A large Mulberry Drupe Shell from Ke Iki Beach on the North Shore dangles from a shiny Scallop textured sterling silver bangle bracelet! This beautiful Drupe Shell slides along the wavy texture of the bangle bracelet that catches the sunlight and sparkles with Aloha! Wear one or a stack a few and have Fun and Enjoy! This bracelet sized at 8 1/2 inches circumference and is 14 gauge sterling silver wire. A trio of three North Shore Puka Shells from Ke Iki Beach dangle from a wave pattern bangle bracelet! 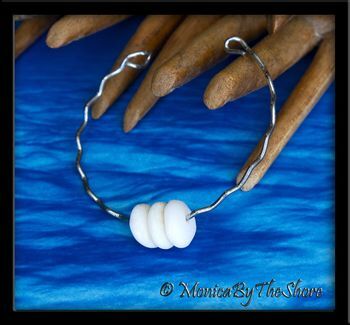 These Puka Shells are shiny pure white and they surf along the wavy open ended bangle bracelet. Waves and Puka Shells, nothing says "North Shore" more than this! A chunky purple Puka Shell from Ke Iki Beach on the North Shore, dangles from a shiny Scallop textured sterling silver bangle bracelet! The shell slides along the wavy texture of the bangle bracelet that catches the sunlight and sparkles with Aloha! Wear one or a stack a few and have Fun and Enjoy! This bracelet sized at 8 1/2 inches circumference and is 14 gauge sterling silver wire. A deeply colored brown Leviteni Cone Shell from Ke Iki Beach on the North Shore dangles from a shiny Scallop textured sterling silver bangle bracelet! This beautiful Cone Shell slides along the wavy texture of the bangle bracelet that catches the sunlight and sparkles with Aloha! Wear one or a stack a few and have Fun and Enjoy! This bracelet sized small at 8 inches circumference and is 14 gauge sterling silver wire. 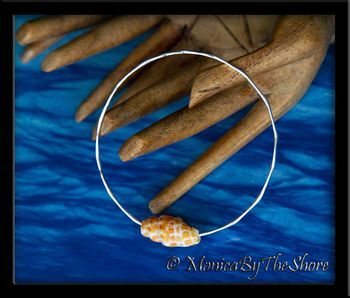 A colorful orange and white Miter Shell from Ke Iki Beach on the North Shore dangles from a shiny Scallop textured sterling silver bangle bracelet! This beautiful Drupe Shell slides along the wavy texture of the bangle bracelet that catches the sunlight and sparkles with Aloha! Wear one or a stack a few and have Fun and Enjoy! This bracelet sized at 9 inches circumference and is 14 gauge sterling silver wire. Two chunky Puka Shells, one spotted, one light lavender, both from Ke Iki Beach on the North Shore, dangle from a shiny Scallop textured sterling silver bangle bracelet! These shells slide along the wavy texture of the bangle bracelet that catches the sunlight and sparkles with Aloha! Wear one or a stack a few and have Fun and Enjoy! This bracelet sized at 8 1/2 inches circumference and is 14 gauge sterling silver wire. Custom for "Fred" from Gainesville Florida, a chunky Puka Shells necklace with the beautiful spotted Mulberry Drupe Shells. This is Fred's 3rd custom necklace that I've designed for him. Wear with Aloha Fred! Original one-of-a-kind design! The tiniest bright white Hawaiian Puka Shells to be found on the beach, hundreds of them, on a single wrap around bracelet! 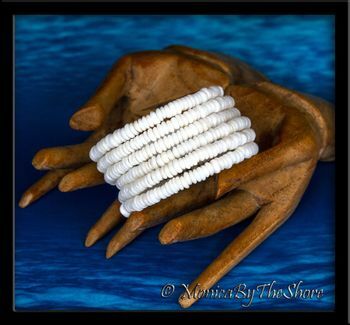 Years in finding these precious little Puka Shells and hours and hours of sorting and stranding them, this fabulous cuff bracelet wraps around the average sized wrist six times! 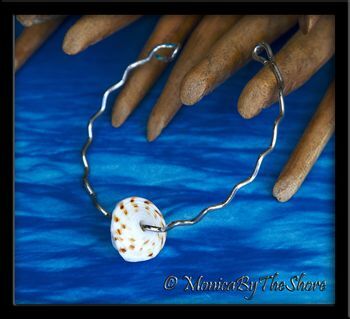 So comfortable to wear as the smooth tiny shells lay lightly against your skin and stay in place as they hug your wrist with so much Aloha! These beautiful seashells are brought to you with Love from Ke Iki Beach shorebreak, on the beautiful North Shore of Oahu, Hawaii! Custom Granulated "Bumpy" Cowrie & Chunky Puka Shells Necklace for "Marty"
Custom for "Marty" from Redwood City, California, pure white Granulated Cowrie (also called "Bumpy" Cowrie) Shell necklace and chunky marbled North Shore Puka Shells necklace. These rare shells are traditionally used for the Niihau Kahelelani and Momi Shell Leis from the Forbidden Island of Niihau. 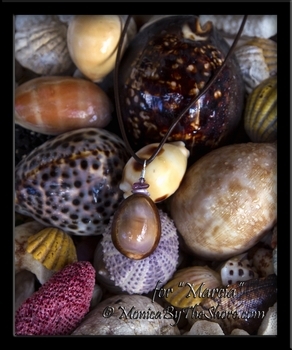 This design accents the Cowrie Shell with the addition of marbled colored chunky North Shore Puka Shells. Natural seashell Aloha fashion in a striking island style design! 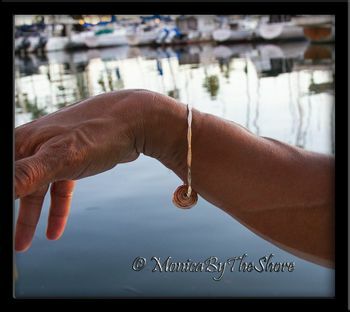 A MonicaByTheShore original Hawaiian Seashell jewelry design, hand made with Aloha on the North Shore, Haleiwa, Hawaii. Custom for "Adam", colorful chunky North Shore Puka Shells with a Granulated "Bumpy" Cowrie in orange hues as a centerpiece for this island style bracelet. A very natural design to be worn with Aloha! Unique hand crafted natural beach seashell jewelry made one piece at a time by MonicaByTheShore of Haleiwa, on the North Shore and Honolulu, the island of Oahu, Hawaii. Unique hand crafted natural beach and sea life jewelry made one piece at a time by MonicaByTheShore of Haleiwa, on the North Shore of Oahu, Hawaii. Custom for another wonderful, long-time customer whose become a close friend and very recently a new North Shore resident, "Marcia"... a Purple Top Cowery Shell with light and dark purple Tourmaline stones and a Swarovski Crystal for a little touch of sparkle, on brown rolled leather cord necklace. With all my Aloha, wear with your never ending smile Marcia! 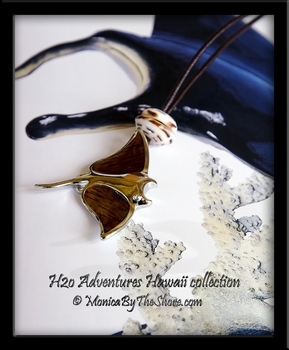 In honor of graceful Manta Ray in Hawaii ... Hawaiian Koa Wood inlay in sterling silver Manta Ray pendant. 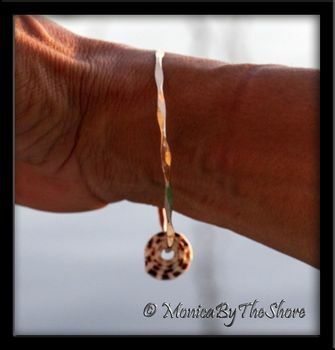 A pair of brown speckled North Shore Puka Shells accent this sealife jewelry creation, on brown rolled leather sliding knot necklace. Adjustable sliding knot leather cord necklace can be worn from a minimum of 15 inches to a maximum of 30 inches in length. 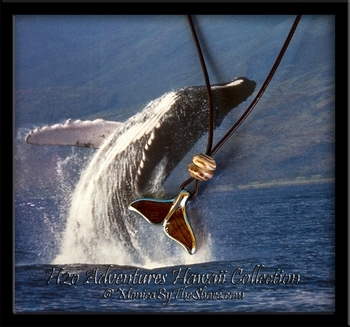 In honor of Humpback Whale Season in Hawaii ... Hawaiian Koa Wood inlay in sterling silver Whale Tail pendant. A pair of tan marbled North Shore Puka Shells accent this sealife jewelry creation, on brown rolled leather sliding knot necklace. Adjustable sliding knot leather cord necklace can be worn from a minimum of 15 inches to a maximum of 30 inches in length. 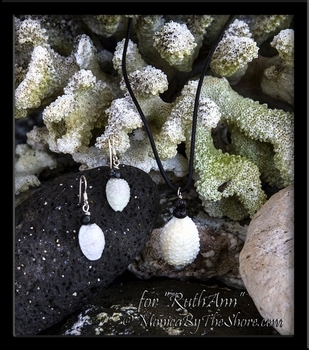 Custom for "RuthAnn" from Lahaina, Maui, pure white Granulated Cowrie (also called "Bumpy" Cowrie) Shell necklace and matching sterling silver earrings. These rare shells are traditionally used for the Niihau Kahelelani and Momi Shell Leis from the Forbidden Island of Niihau. This simplified design accents the Cowrie Shells with the addition of the small black Pipipi Shells and the pendant Cowrie shell drapes from black rolled leather with a stack of two nested Pipipi Shells. Natural seashell Aloha fashion in a friendly island style design! Sand Tiger Shark tooth fossil is long and sharply pointed, approximately 1 1/8 inches in length. Wire wrapped with carved bone beads and silver tone beads & spacers, on 20 inch long rolled leather cord necklace with lanyard clasp. By purchasing only fossil shark teeth jewelry you are helping to prevent the needless slaughter of sharks world-wide for their jaws! Please never buy pure white "modern" sharks teeth, only fossils! Wooden bead colors vary, please note your first two color preferences on "Note to Seller" at checkout. From the long extinct shark species, "Otodus" these large & thick fossilized shark teeth are approximately 2 inches in length & 1 1/2 in width at top. Very impressive! Wire wrapped in gold tone with dyed wooden beads and gold tone beads & spacers, on 22 inch long rolled leather cord necklace with alligator clasp. By purchasing only fossil shark teeth jewelry you are helping to prevent the needless slaughter of sharks world-wide for their jaws! Please never buy pure white "modern" sharks teeth, only fossils! Wooden bead colors vary, please note your first two color preferences on "Note to Seller" at checkout. 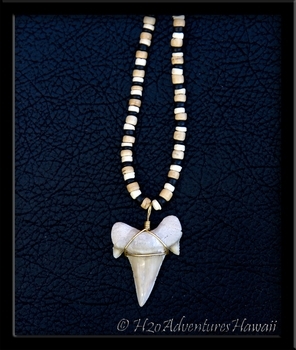 Fossilized Shark Tooth with hand carved Bone Bead on 20 inch natural cotton cord necklace with lanyard clasp. Shark fossil tooth is wire wrapped & is approximately 1 inch in size, varieties include Mako, Lemon, Sand Tiger & Bull Sharks Teeth. By purchasing only fossil shark teeth jewelry you are helping to prevent the needless slaughter of sharks world-wide for their jaws! Please never buy pure white "modern" sharks teeth, only fossils! The fossilized Sand Tiger Shark tooth is long and sharply pointed, approximately 1 1/8 inches in length. Wire wrapped in silver with dyed wooden beads and silver tone beads & spacers, on 20 inch long rolled leather cord necklace with alligator clasp. By purchasing only fossil shark teeth jewelry you are helping to prevent the needless slaughter of sharks world-wide for their jaws! Please never buy pure white "modern" sharks teeth, only fossils! Wooden bead colors vary, please note your first two color preferences on "Note to Seller" at checkout. Angel Wing Shell necklace and earrings set. Angel Wing Shells are wire wrapped in sterling silver and decorated with North Shore Puka Shells. Black twisted cord necklace is 18 inches, with Puka Shell and loop closure. Sunrise Shell hair accessories! Bobby pins or alligator style hair clips, all shells are about the size of a US nickel coin and in beautiful condition! Pony tail & braid Hair Ties too! Brighten up your hair with the Aloha from a Hawaiian Flower from the Sea, the most special seashell in all of Hawaii, Sunrise Shells! Colors will vary, please specify Bobby Pin, Hair Clip or Hair Tie at checkout. 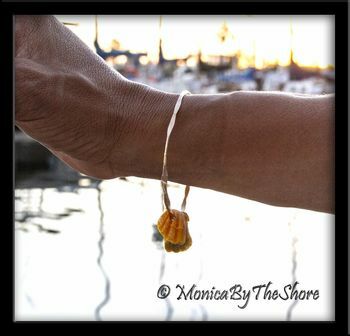 Colorful Hawaiian Sunrise Shell "Fringe" dangles from a shiny Scallop textured 14K gold filled bangle bracelet! Pinks, yellows, greens and orange Sunrise Shells fringes dance along the wavy texture of this bangle bracelet that catches the sunlight and sparkles with Aloha! Wear one or a stack a few and have Fun and Enjoy! This bracelet sized at 8 inches circumference and is 14 gauge gold wire. 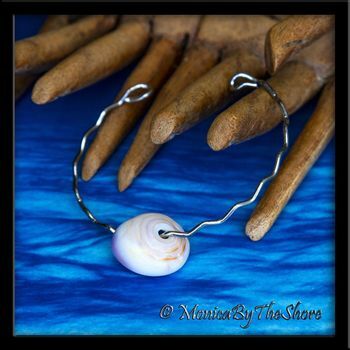 Original, hand crafted, one of a kind MonicaByTheShore Sunrise Shell jewelry, made with Aloha on Oahu's beautiful North Shore, Haleiwa and Honolulu Hawaii. The Hawaiian Miter Shell is always a favorite find among North Shore beachcombers, with its bright orange/red and white coloration and its beautiful pointy, spiral shape. This Miter Shell is an absolute beauty, in perfectly clean, pristine condition with no signs of wear or tear. With a North Shore Puka Shell affixed to the inside, the Miter Shell pendant floats gracefully on a 20 inch twisted cord necklace. A splash of colorful Aloha! One of my favorite Hawaiian seashells, and one that is fairly common in smaller sizes along all North Shore beaches, this Drupe Shell is quite massive in size and has retained its dark brown bumpy spots and bright purple internal color quite well! This Drupe shell is very thick and large in size at 1 1/4 inch. 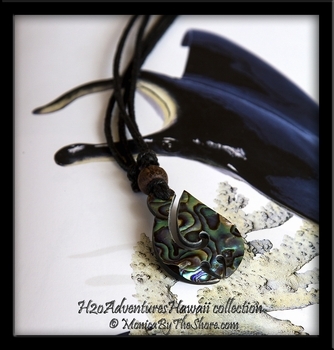 Shells of this size, when found at all, are most often worn down and dull in color, but this shell is a beauty and makes for a very unique Hawaiian Seashell pendant on the black rolled leather necklace. The matching earrings are perfectly matched smaller Mulberry Drupe Shells accented with a stack of Puka Shells and black Tourmaline stones, on sterling silver earwires. Custom for "RuthAnn", Lahaina, Maui. From the long extinct shark species, "Otodus" this extra large & thick fossilized shark tooth is approximately 2+ inches in size. Very impressive! Wire wrapped in gold tone and strung on a black, tan & white coco bead necklace, 18 inches long with barrel clasp. By purchasing only fossil shark teeth jewelry you are helping to prevent the needless slaughter of sharks world-wide for their jaws! Please never buy pure white "modern" sharks teeth, only fossils! Wooden bead colors vary, please note your first two color preferences on "Note to Seller" at checkout. 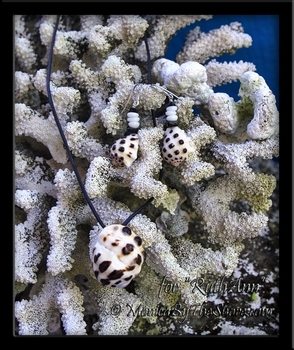 Abalone Shell Makau fish hook necklace with wooden bead, on black cord sliding knot necklace. Adjustable sliding knot leather cord necklace can be worn from a minimum of 15 inches to a maximum of 30 inches in length. Custom for "Christine", colorful, chunky purple, gold & tan colored North Shore Puka Shells sprinkled with an assortment of washed up Hawaiian Seashells, with a large white Seashell from Johnston Atoll as a centerpiece. A very natural design to be worn choker style, and with Aloha! Unique hand crafted natural beach seashell jewelry made one piece at a time by MonicaByTheShore of Haleiwa, on the North Shore of Oahu, Hawaii. Purple Periwinkle, Puka Shell and purple Swarovski Crystal earrings nest and dangle on sterling silver drop and Leaf post earrings. Natural colors, fun to wear as they 'jingle' with your every move! Very Cute! Hand made on the North Shore, Oahu, Hawaii. Jobs Tears, North Shore Puka Shells and Swarvoski Crystal Earrings. Sterling silver daisy accents and wires. Matches Sunrise Shell, Job's Tears and Puka Shell Bracelet. Periwinkles are FUN! 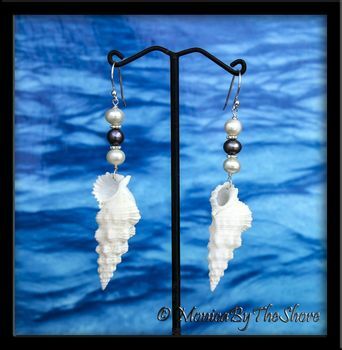 These Periwinkle Shell and Puka Shell earrings "jingle" as you wear them, they are so cute! 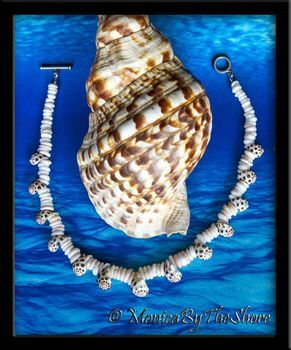 Each Periwinkle Shell is nestled on sterling silver and topped off with tiny Hawaiian Puka Shells and Swarovski Crystals. Natural shell colors. The earrings dangle on sterling silver posts. Too Cool! Endemic to Hawaiian waters and generally found from shoreline tide pools to shallow reefs, this beautiful coffee colored 1 inch Rat Cone Shell is gently cradled in a Fisherman's Net weave basket and drapes from a natural colored 26" twisted cord necklace. 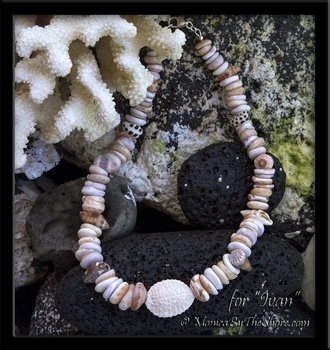 A North Shore Puka Shell and loop closure finishes this organic Hawaiian jewelry design. 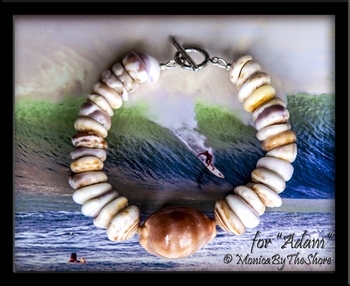 Handmade natural beach style seashell jewelry, made with Aloha on the North Shore, Haleiwa, Hawaii. 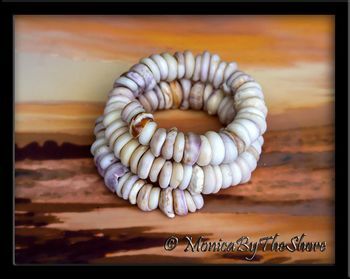 Custom for Ivan", colorful, chunky purple & tan colored North Shore Puka Shells sprinkled with an assortment of washed up Hawaiian Seashells, with a white Bumpy Cowrie centerpiece. 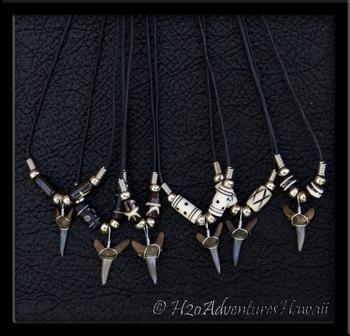 A very natural and masculine design to be worn choker style, and with Aloha! This is a striking, double stacked, black Hawaiian Opihi Shell necklace. These two black Opihi Shells are so perfectly matched they actually look like one shell in the photo, but this two dimensional, layered pendant is much more interesting with added definition and a unique profile with the smaller top shell decorating the larger bottom shell. Beautiful jewelry and a great conversation piece as well! Secured with a North Shore Puka Shell on the back side, this pendant floats on a 20 inch natural twisted cord necklace, with Puka Shell and loop closure. As dramatic as the brilliant Hawaiian autumn sunset, this extra large Opihi Shell is bursting with deep orange and bright white color! The inside of the shell is luminescent pearly white, as beautiful as the outside! The shell is in perfect condition and is generously sized at 1 3/4 inches. A rare find indeed! 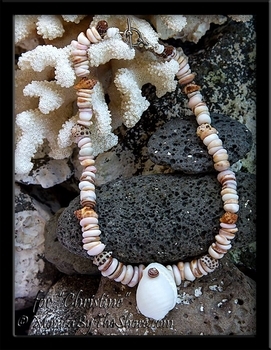 Opihi Shell is set with a North Shore Puka Shell so that it floats freely along the natural twisted cord 20 inch necklace, with Puka Shell and loop closure. Perfect jewelry for the Hula Dancer! 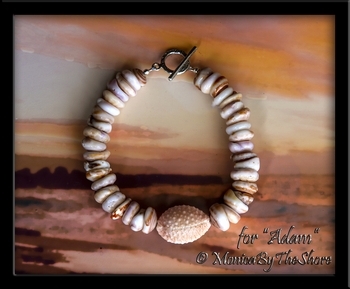 Custom for "Adam", a unique Cowrie Shell (Lyncina Sulcidentata) with brown and light lavender striping is the centerpiece for this multi color chunky Puka Shell bracelet. A very natural design style to be worn with Aloha! The background photo is one I took on a picture perfect day at Rockpiles on the North Shore of Oahu. The surfer riding the wave is our friend Jamie O'Brien, and my son Chris is the surfer paddling out into the wave in the foreground, lower left of the photo. A lot of people ask me where I get my Sunrise Shells... my son Chris finds them all for me when he's not surfing, fishing or shark diving!